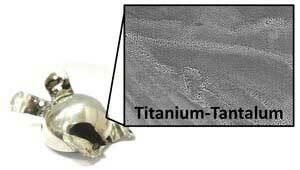 (Nanowerk News) Titanium alloys are a primary choice for orthopedic devices such as knee and hip implants because they have excellent mechanical attributes and resist infection. An A*STAR team has now found a way to produce customized, patient-specific implants with improved stress absorption using a titanium-tantalum powder with intriguing properties (Journal of Alloys and Compounds, "Selective laser melting of titanium alloy with 50 wt% tantalum: Microstructure and mechanical properties"). Selective laser melting (SLM) is one of many emerging three-dimensional (3D) printing technologies that promise to revolutionize small-scale manufacturing. SLM uses high-powered lasers to fuse powdered metals into computer-designed shapes, layer-by-layer. So far, researchers have had success creating biomedical prototypes using titanium-aluminum-based powders. However, concern over aluminum’s long-term effects on human neurology has prompted a search for alternatives. Florencia Edith Wiria from A*STAR’s Singapore Institute of Manufacturing Technology (SIMTech) and Wai Yee Yeong from the Singapore Centre for 3D Printing (SC3DP) at Nanyang Technological University initiated a collaboration that aims to manufacture better titanium alloy biomedical products via SLM by creating innovative metal blends. Alloys with titanium and tantalum are desirable because they are biocompatible and mechanically superior to titanium alone. However, tantalum’s incredibly high melting point (over 3,000 degrees Celsius) means it is not viable economically to turn into finely dispersed microspheres which flow smoothly for SLM printing. Commercial tantalum powders are usually made of rough, elongated microparticles that are formed via gas atomization.